I have a pair of M-125s and currently use Genelex GZ34s that I bought from Jim McShane. Someone I was speaking with here in Bangkok (my home) told me that I could use the 5R4WGB as a replacement for the GZ34. In fact, he recommended it. I looked at the Five Volt Fullwave Rectifier Tube chart that Bob Latino posted. The 5R4 has a much higher voltage drop (67 vs. 17) and a much higher Max PV (900 vs 450). My tube knowledge is limited. I'd like to know if the 5R4WGB can be used as a direct replacement and what the differences between the two tubes mean in practical terms. billd wrote: I have a pair of M-125s and currently use Genelex GZ34s that I bought from Jim McShane. Someone I was speaking with here in Bangkok (my home) told me that I could use the 5R4WGB as a replacement for the GZ34. In fact, he recommended it. 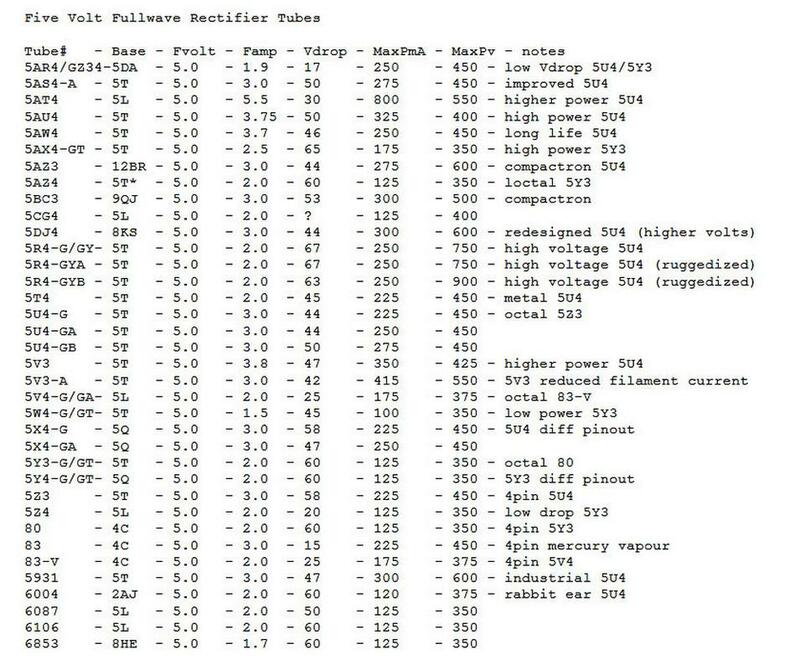 I looked at the Five Volt Fullwave Rectifier Tube chart that Bob Latino posted. The 5R4 has a much higher voltage drop (67 vs. 17) and a much higher Max PV (900 vs 450). You CAN use a 5R4 rectifier in the VTA M-125 amp if you want and yes a 5R4 does have a higher voltage drop (Vdrop) than a 5AR4. As such, the amp's overall power level will drop a bit. Whether you will actually notice the drop in power or not, I can't say ? Below is the 5 volt full wave rectifier tube list and the characteristics of each tube .. Thanks, Bob. That's the chart I was referring to in my post. Since my speakers, Bozak Symphony's, have 93dB sensitivity, I wouldn't expect to notice much difference. B+ capacitor might encounter a short overvoltage. Thanks, Peter. Fortunately, this is an academic question but I am confused since Bob said I can use it but you advise against. I wish I understood more about electronics.